Homemade wills and will-kits: Are you serious? Will-making is not like filling in a form: Wills are legal documents involving many technicalities. As a result, in the words of a High Court judge: “attending to their preparation and execution requires the exercise of professional skill and care”. Of course, a will only operates on death. So, unlike many legal transactions, there’s no opportunity to revisit and fix a problem. For that reason, making a homemade will is like building your own rocket or playing Russian roulette: it’s all or nothing. There’s no second chance. Why roll the dice on something so important? Wills need to be competently drafted. “The disposition effected by the will is not complicated and no doubt the testator had clearly in mind what she intended to achieve. But the way the will is drafted is difficult, and the parties have been put to the trouble and expense of coming to the court seeking directions as to its proper interpretation. If the will had been drafted by a competent legal practitioner, this problem would not have arisen and the parties would have been spared a great deal of trouble and expense”. “The deceased either was offered, or sought, the assistance of an entirely unqualified person to prepare these three documents. That person would no doubt protest that she was just trying to help a friend. She was no help at all. A claim of good intentions is no defence. The fact is that unqualified people who intermeddle in the preparation of documents that have legal operation cause great harm. The defence for such officiousness is often one of trying to save the will maker money. That is sterile. 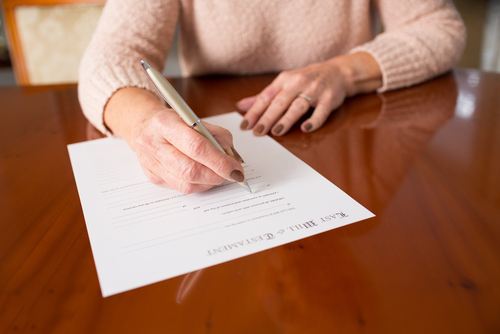 This deceased could have had several wills professionally prepared for a fraction of the cost that has been imposed on her estate by this application. The legal system should not be blamed for that expense”. Fernando and Elizabeth Masci had blended families and completed a pre-printed will form in a way that made a joint will – a legal rarity. They did so poorly, according to the Queensland Supreme Court judge and this is apparent from any objective assessment of the facts. This produced dispute between the blended families, litigation in the Queensland Supreme Court and then an appeal to the Queensland Court of Appeal. Can you imagine the delay, costs and family friction involved? Paul Bates left the residue of his estate – worth over $2.3 million – to the Redemptorist Monastery, which is a building! Bates was a devout Catholic and regularly attended services at the Monastery. Court proceedings were needed to work out if Bates had made a valid gift and, if so, the correct beneficiary. Edward Bear’s estate comprised all the shares in a private company, and no other property. The company owned real estate and other property. Bear left a self-drawn will which contained many inconsistent provisions concerning the gifting of the real estate and other property. The court was required to construe the will to find its meaning and effect. Shirley Hogben made a will which contained a gift of $1000 to Port Adelaide Football Club, but no other gift provision. writing on an egg shell. Notwithstanding the many other aspirants, the patron saints of the Anti-Homemade Will Lobby remain Deborah O’Dell and Peter Brock. But to them and their circumstances I will return. Whenever a homemade will is mentioned, one of my colleagues rubs his hands together and facetiously says “Yippee!” There are certainly a multiplicity of disputes concerning the validity, construction and rectification of home made wills. In that sense they’re a boon for the legal profession, but at what cost to families? I’ve reached the conclusion that someone making a homemade will is (at least) guilty of carelessness with ensuring that his or her assets are inherited by the intended beneficiaries. I doubt that the person is sufficiently conscientious and serious about this important task. And they’re unlikely to hear or heed the message. Hill v Van Erp 1997] HCA 9; (1997) 188 CLR 159; (1997) 142 ALR 687; (1997) 71 ALJR 487. Rogers v Rogers Young  WASC 208, . Re Maria Elizabeth Rudd; ex parte Prince  WASC 107, . In Re the Will of Fernando Masci  QSC 281. Masci v Masci  QCA 245. The court construed the will as providing a gift to the trustee of a community of the Catholic Church which met at the Monastery at the date of the will: Bates v Trustees of the Redemptorist Fathers  NSWSC 539. The court gave it meaning by applying authority that a testator who is the sole shareholder and controller of a company can direct the transfer of property owned by the company: Garbett v Bear  NSWSC 1524. The court found that the document was nevertheless a will but that Hogben died almost totally intestate: Shirley Colborne Hogben (dec’d)  SASC 91. Alan Yazbek v Ghosn Yazbek  NSWSC 594; The Estate of Roger Christopher Currie, late of Balmain  NSWSC 1098. Estate Edwards: Treacey v Edwards  NSWSC 846. Cassie v Koumans; estate of Cassie  NSWSC 481. In the estate of Slavinskyj (1988) 53 SASR 490: a photograph of the wall was admitted to probate. Yu, Re  QSC 322. The finding that the phone message amounted to an informal will then lead to a construction suit: Yu –v- Yu  QSC 373. In the estate of Torr  SASC 49; (2005) 91 SASR 17. Hodson – Barnes (1926) 43 TLR 71. The organisation doesn’t exist except as a figment of my mind. Darryl Browne is a Councillor of the Law Society of NSW and Deputy Chair of the Society’s Elder Law and Succession Committee. The views expressed in this article are his own.